BUFFALO, N.Y. -- University at Buffalo women's basketball senior guard Cierra Dillard headlined the 2018-19 Preseason All-Big 4 basketball teams, which were announced Friday afternoon in advance of the official start of the college basketball season. 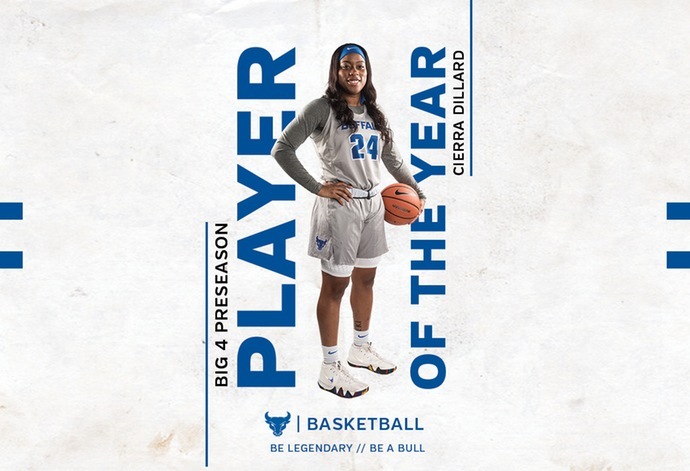 Dillard was a unanimous selection for the First Team along with being named Big 4 Player of the Year for the first time in her UB career. Three Bulls saw three players earn a spot on the two All-Big 4 squads that were voted on by media and athletic communications staffs that cover Buffalo, Canisius, Niagara and St. Bonaventure. Dillard and Summer Hemphill earned the First Team nod while senior Autumn Jones was placed on the Second Team. Dillard enters her senior campaign as the best player in Western New York and she will be looked upon to lead the Bulls back to the NCAA Tournament this season. The Rochester, NY native is coming off of a great junior season that saw her average a team-high 16.2 points, 5.2 assists, 4.1 rebounds and 3.0 steals while knocking down a team-high 85 three-pointers and recording a program-record 105 steals. When the lights were the brightest last season during the NCAA Tournament, Dillard shined for the Bulls as she averaged 29.0 points, 5.3 rebounds, 4.3 assists and 3.3 steals as they moved onto the Sweet 16. Hemphill is coming off of a career year during her sophomore campaign as she averaged 10.1 points, a team-high 7.3 rebounds, 1.6 steals and 1.5 blocks while shooting a team-high 57.2% from the floor. The junior is the only returner in the NCAA to average at least 10 points, 7.0 rebounds, 1.6 steals, 1.5 blocks and shoot 57% from the floor a season ago. The Buffalo native led the Bulls in rebounding on 15 occasions while setting a division I record for rebounds in a game with 23 in the Bulls win over Ohio on February 24. Jones returns to the Bulls after putting together a strong first season in a Buffalo uniform after transferring from Pensacola State. The athletic wing finished off her junior campaign averaging 6.7 points, 1.5 rebounds and 1.2 steals while connecting on 45 triples off the Buffalo bench. Jones proved to be one of the streakiest players in the conference last season and when she was on, she was really on. The sharpshooter put together six straight double figure scoring games heading into the NCAA Tournament a season ago and she chipped in with eight points off the bench in the Bulls Sweet 16 loss to No. 2 South Carolina. The Bulls will open up their 2018-19 campaign on Sunday, November 11 as they travel to Maryland Eastern Shore for a 5:00 pm tip.